Observation notes: Found him/her on a large patch of cold concrete. There were no nearby plants (except a green pine about 100 feet away). Wasn't moving until I kept it in my hand for a few minutes to warm up. Would like to know what species so I can put him out on the appropriate food source, or maybe even raise him until spring. 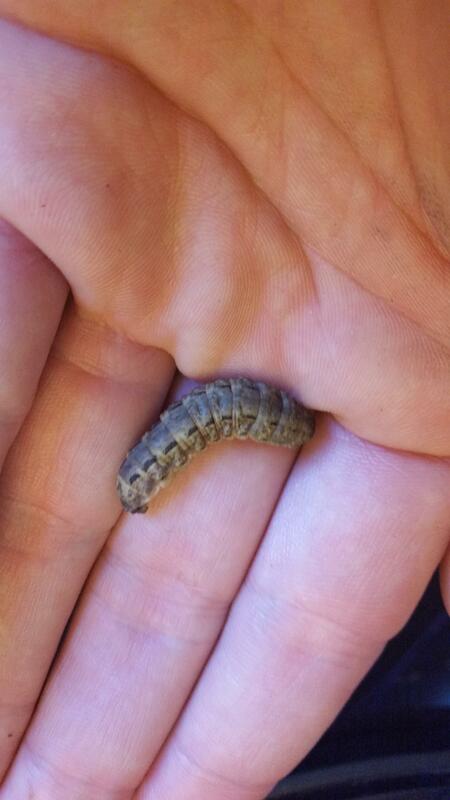 Coordinator notes: This is the caterpillar of the invasive European Yellow Underwing moth, Noctua pronuba. They typically emerge from diapause on warm winter days (50+ degrees) to feed on any host plants (usually cultivated) they can find growing at the time: Fragaria, Solanum, Beta, and Vitis species. These caterpillars are often blown onto paved areas on windy days during the winter, which is probably why you found it where you did. If you want to raise it, I would suggest using the "backyard" technique. Keep it in a ventilated terrarium outside (tiny holes to prevent parasitism), completely out of the sun, and provide it with host plant cuttings on days that reach ~50 degrees or higher. This will allow it to naturally complete its life cycle, eventually pupating and emerging as an adult moth (likely in May or June). Please do not release it into the wild, however, as it is a garden pest that only recently invaded Colorado in 2005. Its orange-yellow underwings would make for a nice mounted specimen, however. Anyway, thanks for the submission!